Metalships & Docks has contrated an arctic factory freezer trawler for Niisa Trawl Aps, located in Nuuk, Greenland. The new vessel is of ST-118 design, a tailored design for operation in heavy ice at the coast of Greenland. 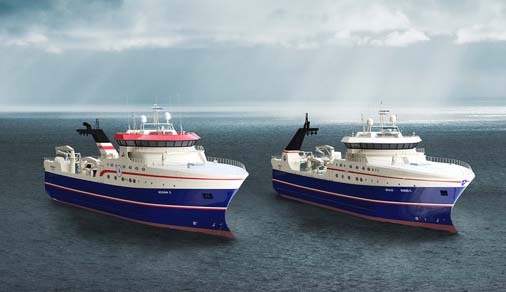 The new vessel will be named “Regina C” and it will have a length of 80 m and a beam of 17 m. It will be built according to a DNV GL class with the highest Baltic ice-class rating. The vessel will be built with an accommodation for 32 persons, all arranged in modern, well appointed single and double cabins. Regina C will make with the highest possible safety standards for the crew, during all kinds of operations and weather conditions. The vessel will be outfitted primarily for the northern coldwater shrimp fishery, but options for other fisheries have been incorporated into its design. Regina C will make with high focus on reduction of any polluting discharges to water or air and the recovery and recycling of excess energy wherever possible. For Metalships, this is a very important contract secured in a period where the shipyards are suffering due to low activity. Metalships & Docks SA is a shipyard with excessive experience in building very specialized vessels. The “Regina C” is scheduled for delivery in August 2018.